This is the pre-publication version which was subsequently revised to appear in Creation 31(2):56. The peacock’s spectacular fan-like tail, complete with patterns that look like eyes, has all the hallmarks of having been designed—by a Designer. So it’s hardly surprising that the difficulties of explaining this by evolution evidently presented a ‘headache’ to Charles Darwin. To be precise: ‘The sight of a feather in a peacock’s tail, whenever I gaze at it, makes me sick!’ Those were his exact words which he wrote in 1860,1 the year after he published his (in)famous Origin of Species. It wasn’t until 1871, eleven years later, that Darwin proposed his ‘theory of sexual selection’ in an effort to provide a naturalistic (evolutionary) explanation for peacock feathers and other ‘seemingly useless’ male ornaments. 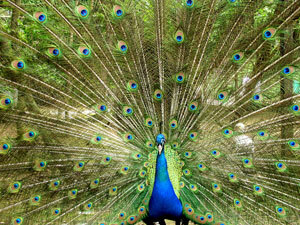 Basically, Darwin’s idea was that the male peacock’s spectacular feathers and fan-like tail evolved (i.e. arose naturally) in response to female (peahen) mate choice. That is, the males with the most attractive tails would be more attractive to the females, thus mate more and pass on more of their genes, which include the genes for attractive tails, to the next generation. The researchers judged tail quality in two ways. First, they measured tail length. Second, they counted the number of eyespots across the fanned tail. The longer the tail, and the more numerous the eyespots, the better the ‘quality’ of the tail. They then recorded whether females chose mates with the best-quality tails. But, to their (and many other evolutionists’) surprise, they found that females mated with ‘poor-quality’ peacocks as often as with ‘flashy’, ‘high-quality’ males. It’s not as if the researchers set out to contradict the theory—just the opposite in fact—they had planned to confirm it. It’s not as if the researchers set out to contradict the theory—just the opposite in fact—they had planned to confirm it. But despite continuing their research for seven years, during which time they observed 268 matings in a feral population of Indian peafowl (Pavo cristatus), the researchers could not link the elaborateness of a peacock’s tail with his mating success. Put simply, the male’s feather train failed to impress or excite, much less interest, the females. Darwin’s sexual selection theory has been increasingly under attack in recent years.8 The theory’s latest spectacular failure to explain the very thing that Darwin concocted it for basically leaves evolutionists back at ‘square one’. That is, just like Darwin in 1860, they would have every reason to gaze at a peacock’s tail, and feel sick! Darwin, F., (Ed), Letter to Asa Gray, dated 3 April 1860, The Life and Letters of Charles Darwin, D. Appleton and Company, New York and London, Vol. 2, pp. 90–91, 1911. Return to text. Morell, V., Peacock feathers: That’s So Last Year, ScienceNOW Daily News, 2 April 2008. Return to text. Takahashi, M. and others, Peahens do not prefer peacocks with more elaborate trains, Animal Behaviour 75(4):1209–1219, 2008 | doi:10.1016/j.anbehav.2007.10.004. Return to text. Viegas, J., Female peacocks not impressed by male feathers, Discovery News, 28 March 2008. Return to text. Being preened to perfection is no guarantee of success, New Scientist 197(2649):16, 2008. Return to text. Barras, C., Have peacock tails lost their sexual allure?, NewScientist.com news service, 4 April 2008. Return to text. Burgess, S., The beauty of the peacock tail and the problems with the theory of sexual selection, Journal of Creation 15(2):94–102, 2001; <www.creation.com/peacock>. Return to text. Catchpoole, D., Peacock poppycock? Creation 29(2):56, 2007, <creation.com/poppycock>. Return to text.